The model represents a Menger sponge: a (nearly) three-dimensional fractal cube, which has so many holes it contains no volume at all, but is so crinkly it has infinite surface area. 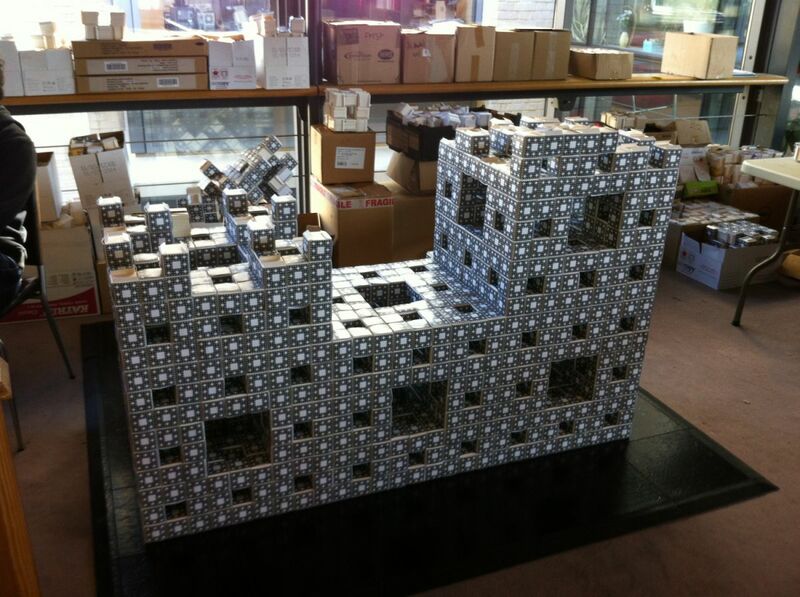 The Level 3 model cube, which is proudly on view in the Centre for Mathematical Sciences, is built out of 8,000 smaller cubes, each made from 6 folded business cards. Our finished Level 3 model Menger sponge is a marvellous feat of paper folding, made of 48,000 business cards using no glue or tape. It weighs over 90Kg and is around 1.5 metres tall. Students in Years 7 to 10 at twenty schools across Cambridgeshire, Hertfordshire and Bedfordshire prepared thousands of basic cubes - each made out of six business cards folded together - for the MegaMenger build, co-ordinated by the regional Further Mathematics Support Programme. To start the build we held a public event at the Centre for Mathematical Sciences on 25 October, where enthusiastic visitors of all ages joined in. Never having built a giant model fractal before, we weren't quite sure what to expect, but as the day wore on the mammoth scale of the task became clear! However, mathematicians are not put off just because something may be difficult or require perseverance, and the Menger build attracted a dedicated band of helpers. The build was finished off over the next few weeks by Cambridge students and staff (we spotted a Fields Medallist helping) in odd moments between lectures, with the fractal growing slowly but steadily in the Maths Faculty's central cafe area. 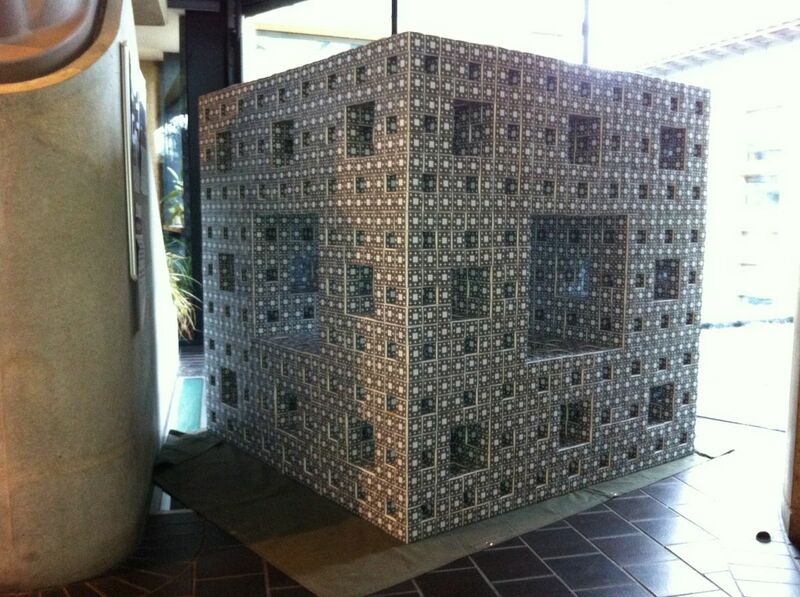 The finished model Menger Sponge will be on public display during the Cambridge Science Festival at the Maths Public Open Day on Saturday 21 March 2015. Meanwhile, you can read more about the maths behind the model on Plus, our free online maths magazine. 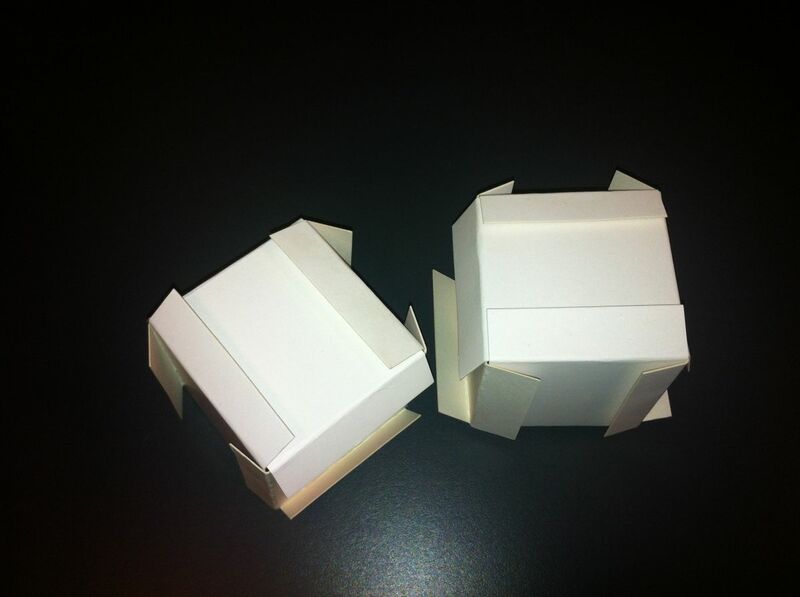 The basic building block cubes, each made out of 6 folded business cards. 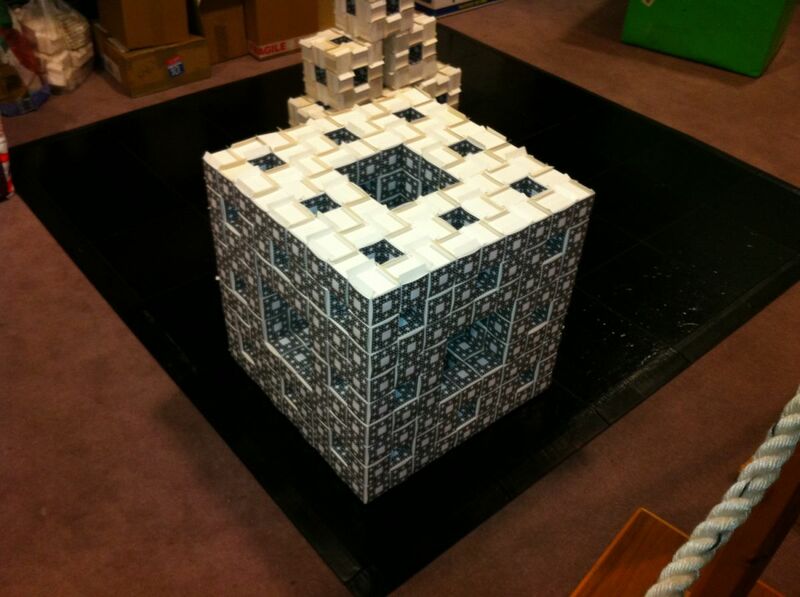 The build: Level 1 cubes, each made out of twenty of the basic building block cubes, stacked behind a Level 2 cube. There are twenty Level 1 cubes in a Level 2 cube, and twenty of the large Level 2 cubes in the giant Level 3 cube. 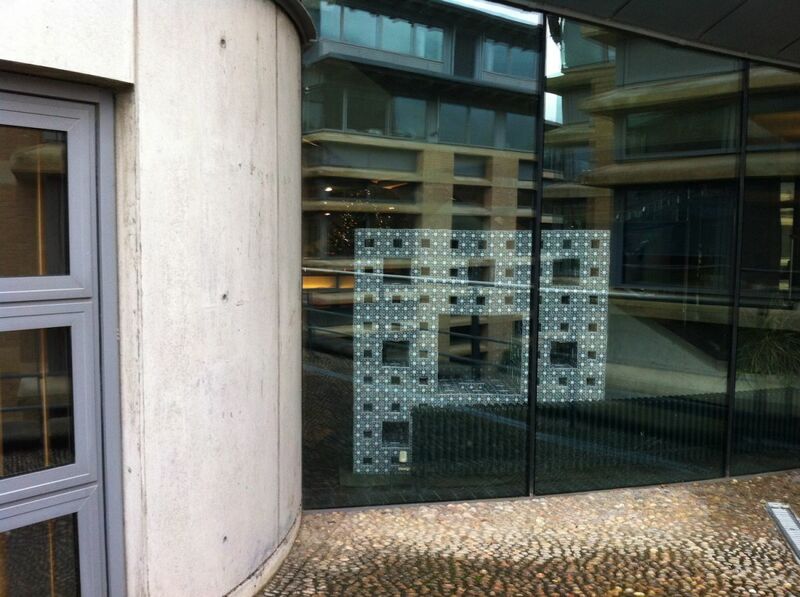 The finished Level 3 Menger Sponge model, seen from outside the Centre for Mathematical Sciences. The finished Level 3 Menger Sponge model.